Chalet 110 m2 'LE REFUGE DES HERISSONS' independent located in the heart of the village of Le Frasnois (Altitude 800 m) very close to the Hérisson waterfalls and the 4 lakes of Ilay, Narlay, Petit and Grand Maclu. On site: authentic and wild landscapes of the country Lakes: Beautiful Ballads, Lakes, Waterfalls of the Hedgehog 4 lakes and viewpoints From Eagle Peak, Fishing, Gourmet restaurants, Potter, Wood Store items Jura, Bicycle Rental, Depot bread. 4 Km Village of Lime Dombier and St. Pierre Small shops, ski area with background track and snowshoes. 10 Km Village St Laurant in Grandvaux: Stores. with ski equipment rental, cross-track and snowshoes. 12 km chalain Domaine with swimming pool and water games. A 14 Km Village of Clairvaux: Museum, Lakes Regional products (cheeses and Jura products). All shops. LE REFUGE hedgehogs is equipped for 6 people with pets. The beds are distributed according to your request with sheets and made upon arrival. On the ground floor: a large living room with wood stove (kitchen, living room); Room No. 1 bed 160 (2 people), Baby bed on request; a bathroom with shower; WC; storeroom; Ski (skis, bicycles); WC # 1. Room No. 3 adjustable 160 for 2 people or 80 for 2 X 1 person) WC No. 2. Equipment Domestic: Dish- dishes; Microwave grill; Four; Toaster; Coffee; Fondue; Raclette, crepe; Mixer; Ironing Facilities, Washing machine, Dryer. Leisure Equipment: Barbecue, Garden table; Deck chairs; TNT large screen TV, DVD player, playground slide and swings Structure :() Baby Foot. - The receipt of 30% deposit confirms the reservation of the cottage. - Upon arrival a security deposit of € 300 is required. You will be returned to you after a new inventory. - The tenant is required to ensure the chalet's care. A certificate of insurance will necessarily be made before the arrival of tenants. - Wood for heating wood stove included in the rental price. - Tourist tax to pay when you leave for the town: 77 euros per adult per day, free for children under 18 years. Très bonne location. A recommander. Seul le parquet du 1er étage est très bruyant car il craque énormément. Ce peut être un inconvénient lors d'un déplacement la nuit. Sinon, rien à dire, tout est OK. Les propriétaires sont très accueillants. Nous avons passé une semaine parfaite dans ce chalet de M et MME BOLARD qui nous ont très bien accueillis. Une très bonne adresse pour passer des vacances en famille ! nous avons regretté l'impossibilité de faire fonctionner le téléviseur et la quasi-absence de réseaux pour les smartphones. Nous avons apprécié les propriétaires pour leur gentillesse, leur disponibilités et leurs conseils. Chalet très confortable, bien équipé, bien isolé et bien chauffé avec le poêle à bois. Propriétaires sympathiques. Il ne manque que le Wifi. Das Häuschen ist sehr gut gelegen, die Gegend ist wunderschön und bietet viele Wandermöglichkeiten auch ohne Anfahrt. Die Wasserfälle von Herisson sind ebenfalls fußläufig erreichbar, waren aber aufgrund des heißen Sommers eher Rinnsale. Das Haus ist vollständig aus Holz mit Fliesenfußboden, verfügt über die angegebenen technischen Geräte in sehr gutem Zustand. Das Geschirr ist für sechs Personen knapp, wir waren aber nur zu zweit, das reichte. Vor dem Fernseher haben wir einen Tisch und einen Sessel vermisst. Die im Text angegebenen Handtücher fehlten auch. Der Kamin hat in den schon kühleren Nächten für angenehme Wärme gesorgt. Man muss aber beachten, dass er im Erdgeschoss steht, was gerade beim Anheizen ein wenig Lauferei bedeutet. Unten gibt es nur den Esstisch, so dass wir abends lieber oben saßen. 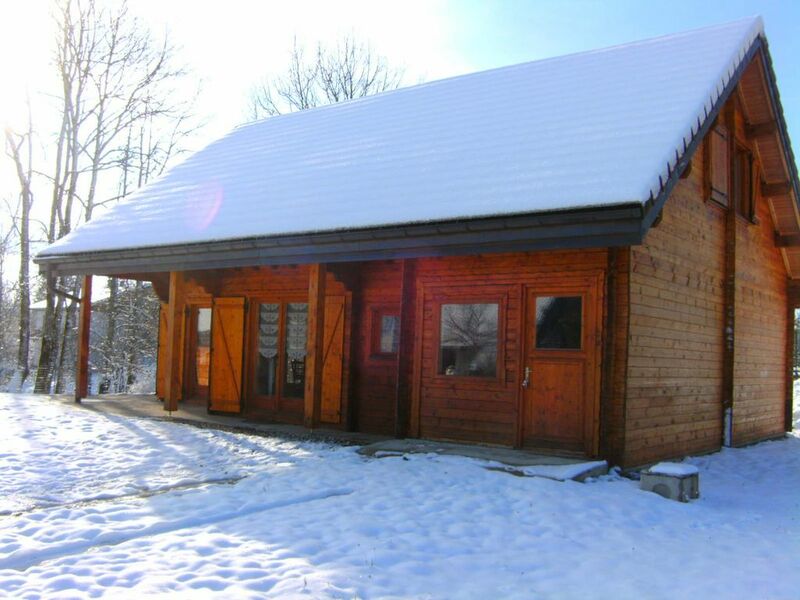 Chalet bien situé au centre de ce petit village tranquille.Les propriétaires sont très acceuillants et disponibles pour les informations et visites alentours. Ce grand chalet très propre est très bien équipé en matériel cuisine ,lessives,chambres,desserte,...rien ne manque. visit Cascades of Hedgehog Gorges Langouette, walks around the lakes of Ilay, Narlay, Petit and Grand Maclu. Swimming, cross country skiing, snowshoeing, mountain biking, pedestrian hiking and horseback riding. walk to the viewpoint of Eagle Peak and 4 lakes. shopping at the boisselerie Hedgehog. Horseback riding 'The team of 4 Lacs'. Shoping in Fruitières County + regional products (bio Saint-Maurice Crillat) or traditional Clairvaux the Lakes.